Local actors who influence the public real estate market in the Chicago Area are mainly public institutions, professional organizations, and large companies. First of all, public institutions in the real estate are the Department of Planning and Development of the City of Chicago, the Chicago Housing Authority, the US Government, the State of Illinois, and the Federal Reserve. The Department of Planning and Development of the city of Chicago as well as the Chicago Metropolitan Agency for Planning (CMAP) roles mainly consist in promoting a comprehensive growth and sustainability of Chicago and its neighborhoods. It controls the area’s zoning and land, regulates the policies (from simple household who wants to invest and build a new land to real estate companies who wants to invests and build large blocks of buildings), and advise on the economic development. Their role is also to promote a sustainable development and avoid any law enforcement against the environment. They provide help for business and real estate development as well. The Chicago Housing Authority, in his purpose of helping individual with limited means to settle down in the Chicago area also have an influence on the real estate market, as their involvement is mostly political and it might stabilize the housing prices in some zone, while the overall price in the area might increase during time. So in addition to provide security and stability to some Chicagoans, they also influence the market, as these zones outshines different data than the overall tendency in the whole area of the city of Chicago. The US Government and the State of Illinois also influence the real estate market, by offering and controlling the tax credits, deductions, and subsidies. It directly affects the mortgage market, and therefore, the real estate market in overall. The Federal Reserve Bank can also affect the real estate market, by modeling the interest rates. On another aspect, professional organization, such as the Chicagoland Chamber of Commerce, local neighborhood chambers (North side, South, Loop…), and foreign-American chambers (FACC, GACC, SACC…) can also influence the real estate market, as they have a political influence and an advising role to companies when they want to choose their location. They also can advertise some neighborhoods that are in redevelopment to companies, to bring new investors and business to a certain area. The Urban Land Institute of Chicago also influence the market in the same way as a CC. The Chicago Bar Association also influences the market from a legal stand of point. At last, large companies implemented in Chicago indirectly affect the real estate markets, business wise, as the industries and the dynamism of Chicago in general affect the real estate, as it can influence the buying power of the Chicagoan, also increase the inflation rate in the area. It also affects the market directly, as employees of these large companies tend to settle down lose to the area they go to work, and therefore influence the housing price. Let’s analyze in more depth the role of the Department of Planning and Development and the large businesses in the Chicago area. First, the department of planning and development started a project in which they promote innovation and entrepreneurship, by helping improving public services and rationalizing business regulations in Illinois. They promoted a sustainable development for industries which significantly improved the number of new companies in the areas. Thanks to these improvements, the number of business real estates in Chicago constantly increases since the last decade. Moreover, as the companies settling in Chicago are more and more numerous, it affects both the business and the individual household real estate markets. Indeed, from a household stand of point, we can see that the economy in the area directly influence the reality of individuals. 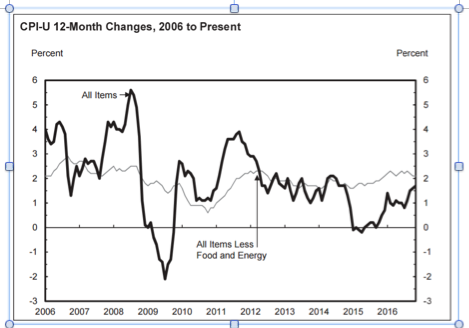 From Charts 1 and 2 shown below, we can observe a correlation between the local CPI (Consumer Pricing Index), which reflects the buying power of the Chicagoans, and the average home sales prices. When we look at the period 2014-2015, we can see that the trend in the CPI changes is the same as the average monthly sales prices: as the buying power increases, the inhabitant of Chicago in overall can afford to pay a more money for buying houses. From the Chart 3, showing the unemployment rate of the Chicago area in blue. 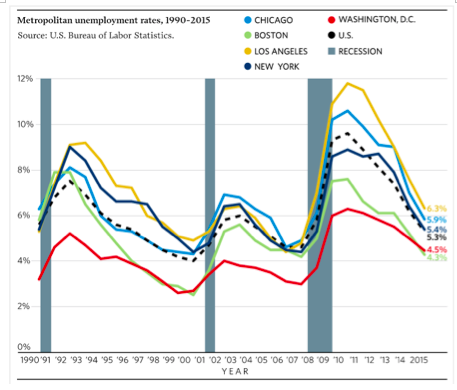 We can see that the unemployment in the area significantly plummeted since 2011. It is mainly due to the dynamism of the corporation in the area, of new organizations settling down locally and the raise of innovation. As more Chicagoan find jobs, they also get more buying power and have more means to invest in properties. However, in the long term, the number of home sold is quite stagnant since 2011, after a sharp decrease in 2009-2010. It is mainly due to the fact that new land are bought by large companies instead of households, so the private individual real estate market stayed still.